We've discussed Biblical Hebrew words that entered Greek (and later English): arbiter from erev, cider from shekhar and more. And of course there are many Greek words that entered into post-biblical Hebrew: afikoman, kalpi, etc. But what about a Greek word that entered into Biblical Hebrew? [in] the days of Solomon, when we find the undoubtedly Greek lishkah "hall", from Greek leshke "public hall," lit. "place for chatting". He is talking about a sort of office found in the Temple. 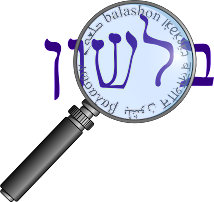 (The word means "bureau" in modern Hebrew). Both Klein and Kaddari say lishkah לשכה derives from the word נשכה nishka - another type of work room. But Rabin wrote with great certainty, and his credentials are as solid as Klein's and Kaddari's. The most famous Lesche was the Lesche of the Knidians at Delphi. Most translations for lesche go along with Rabin's idea - "club room", "place to talk". But I was unable to find anything explaining the etymology of lesche using that definition. "Lescha-liskah: Sakrale Gastlichkeit zwischen Palastina und Griechenland." In Religionsgeschichtliche Beziehungen zwischen Kleinasien, Nordsyrien und dem Alten Testament: Internationale Symposion Hamburg, 17-21 Marz 1990. Edited by B. Janowski, et al., 19-38. Orbis Biblicus et Orientalis 129. Gottingen: Vandenhoeck & Rupprecht. The etymology of lescha (Attic lesche), usually accepted, is from the Indoeuropean-Greek root lech- = English lie/lay, German legen/liegen, + a suffix -ska, lech-ska > lescha. The primary meaning then would be a room or or cabin to stay overnight; it is used for an additional building at sanctuary or a graveyard, where people assemble and stay together. Here the meaning of Hebrew lishkah seems identical: additional building at a sanctuary; no Hebrew etymology. My (not demonstrable)idea is that the word came to Palestine with the Philistines, who definitely had an Aegean background. If I have any readers who understand German and would be interested in reading the essay and explaining its findings here, I'm sure many of us would be grateful.